You probably can’t teach your dog to read, but you can teach him to recognize the letters of the alphabet. Get your clicker and treats! Start by writing a big letter A on a piece of paper. If your dog tends to get excited when he’s working or likes to rip paper, you may want to paint the letter onto a piece of wood or something else more solid so that he won’t shred it. 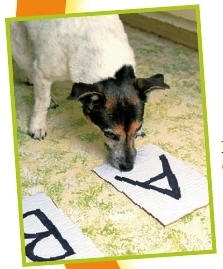 Place your letter on the ﬂoor near your dog and wait until he sniffs or noses it, then click and treat. Repeat several times. Once he is going to the letter consistently, add your cue word, “A.” Repeat several times until he is consistently nosing the letter when you give him your cue. Then put the A away. Now write or paint a big letter B on a piece of paper or wood. Do the same thing you did with the letter A, only this time tell your dog “B.” Don’t forget to reinforce him when he touches it. All he has to do is touch it with his nose. Repeat several times. Now comes the tricky part. Get out both letters and place them a little bit apart on the ﬂoor near your dog. First ask him to show you A. If he goes to the correct letter, click and treat. If not, wait patiently until he does. Repeat several times, always asking for A. Move the letters around occasionally so that he has to look at the letter and recognize it, and not just go back to the same spot each time. It may take a while before your dog always goes to the letter A. Once he does, you can do the same with B. Then you can try alternating which letter you ask for. Once your dog really knows the ﬁrst two letters, you can gradually add more. Remember, this is going to take a while! However, eventually he will be able to recognize and pick out several letters (don’t expect the whole alphabet). Then you can have him do tricks like spell out his name for an admiring crowd.